Now that Debby has passes hopefully things will get back to normal. The rain has been incredible and devastating for some. Thankfully we were spared. 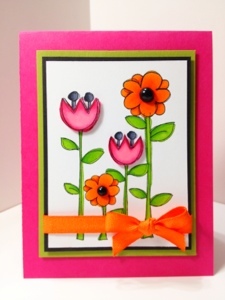 Today's card is made using my favorite colors...pink, orange and green. My friend Sharon was kind to stamp a few shoes for me to play with. I didn't know how many time I would actually want to do that much intricate coloring! It didn't take as long as I expected and I'm pleased with the results. I don't worry about a lot of shading as some of the spaces were so small just a touch of the tip of the pen was all that was needed to color. Posted by Karen at 8:09 AM 0 Click here to leave me a comment. Oh what a perfect card for today. It has poured rain all night long. Debby has really dumped a lot of water in the last twelve hours. Today's card is made with the new Bootiful stamp set from Stampin Up! I wasn't going to order this set but for some reason I ended up throwing I on my order at the last minute. I stamped the first boot on the cardstock and stamped another on a piece of scrap. Once I colored the boots with my Copics, I cut out the extra one and layered it in the cardstock with dimensionals. 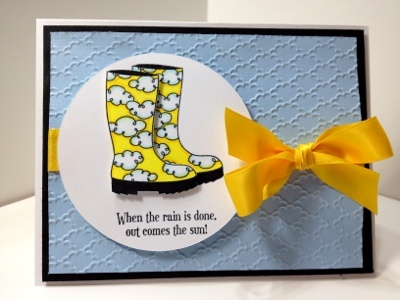 The background is one of the new embossing folders from Stampin Up as well. If you're in not so sunny Florida today. Stay safe and stay dry! Posted by Karen at 7:04 AM 0 Click here to leave me a comment. TGIF! Busy weekend ahead. Sharks game, girls night out and whatever comes next! Bring it on!!! Today's card is simple and sweet. I used the Ditto stamps and stamped the main image with Momento Tuxedo Black and colored with Copics. I went back with my blue spica pen and added some "swirl" accents for a little sparkle. 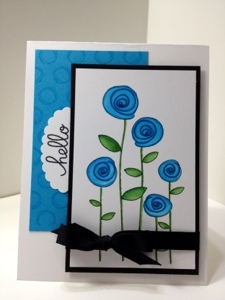 I stamped the blue mad with Momento Blue ink using the drawn circles stamp. 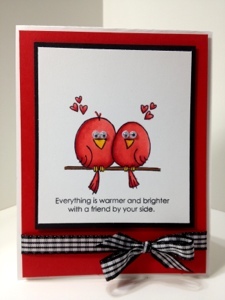 The sentiment is punched with Stampin ups scalloped oval. For a finishing touch I added a black bow to offset the black mat. Posted by Karen at 8:04 AM 0 Click here to leave me a comment. I just love these birds and have already used them numerous times. I just need to figure out a cool "feathery" detail for them. Join Raisin Boat in the challenge for a chance to win one of the sets! I stamped the birds and colored them with Copic Markers and stamped the background to make patterned paper. Layered my mats and added a ribbon. Cute as can be! Don't forget to sign up to follow me via one of the links to the right so you don't miss any inspiration! Posted by Karen at 9:57 AM 2 Click here to leave me a comment. TGIF! Here's a quick card I made. You could change the image and sentiment to fit any occasion. 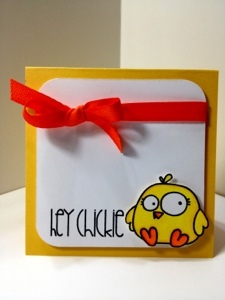 I used the chick and sentiment from paper smooches. I colored the chick with Copics and cut him out and added him to the card using dimensionals. Simple and easy design for a last minute card! Posted by Karen at 6:47 AM 0 Click here to leave me a comment. Washi tape? Yet another collection to have to have all you can hoard! There are so many colors an patterns how could you possibly decide? Today's card is my second creation using Washi Tape. You will see the first one a little later. I used the Darcie's Monster Birthday set for my cute little monster. His eyes and mouth are separate stamps. I have attached them using dimensionals. I cut my orange tape to create a thick and thin strip and the green is a partial piece as well. The sentiment is also from Darcie's! 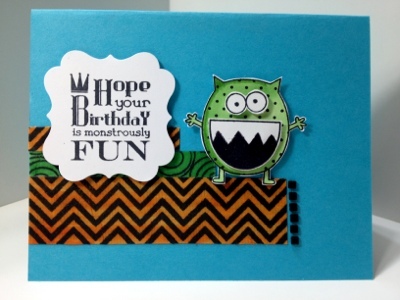 Perfect card for your little monsters birthday! Posted by Karen at 8:26 AM 0 Click here to leave me a comment. And I have some new friends! 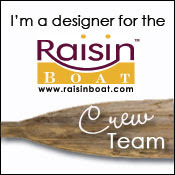 I was chosen as well as four other talented ladies to be part of the design crew for Raisin Boat! 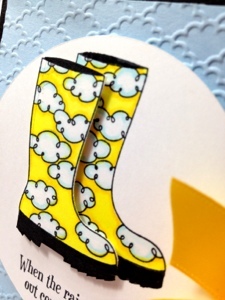 I'm so excited to share new ideas with you using new products exclusive to Raisin Boat! My first card is from the Perfect Partners set. I love coloring their images with my Copics. I stamped my image on Boat House white cardstock and once I colored the image I added googlie eyes! To finish off my card I added the gingham ribbon in a perfect bow! Posted by Karen at 8:14 AM 3 Click here to leave me a comment. More rain in sunny Florida. The grass is high and the ground is saturated and it's supposed to rain all week. 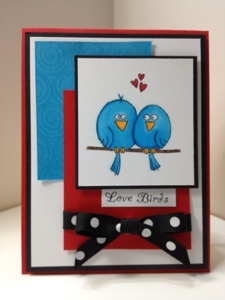 Today's card uses Paper Smooches. I stamped the single stamp (balloon, cat and rabbit) and then off stamped two more balloons and added with of course they are colored with Copics. 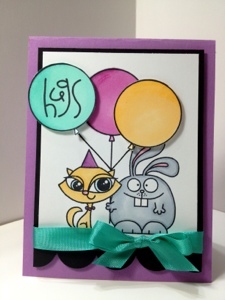 I then stamped the hugs in one of the balloon and added the scalloped mat with ribbon. Posted by Karen at 6:05 AM 1 Click here to leave me a comment. We have had rain for the last two weeks. Anyone with a flower garden has had a lot of watering! Today I'm sharing my little flower garden that doesn't require any water. Unused the Ditto cling stamp from Michaels and colored with my Copics. I stamped a couple of the images again and added them with dimensionals. The black centers are adhesive pearls. Life the bright colors! Posted by Karen at 6:35 AM 0 Click here to leave me a comment. When we moved to Jacksonville back in '95 they did away with all is the 7 Elevens. Oh the horror! How was one to live without a Slurpee? When Katie was little we would stop at 7 Eleven when we went home to Virginia and get the must have Slurpee (preferably grape for me). 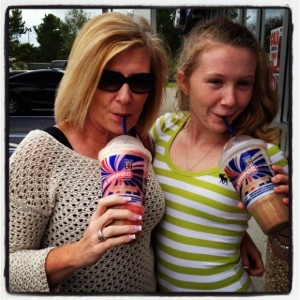 She would always ask what's a Slurpee? It's something you should never have to live without. One of life's simple pleasures. Well Jacksonville woke up and is bringing them back. We just happened to be on the Northside of Jax today and spotted the first one so here we are enjoying a wonderful treat. Katie had Coke and I had coke, cherry with banana in top! O thank heaven! After two weeks of doctors appointments it was a wonderful treat. Posted by Karen at 10:18 PM 0 Click here to leave me a comment. TGIF!!! I am so glad it's Friday. Another monsoon storm last night. We are definitely catching up on the lack of rain over the last several months. Today's card is made using another retired Stampin up set that I have decided to part with. I can't keep them all and these images are pretty small so I decided to let this one go. I colored the image with Copics cut my coordinating squares and added a bow pretty simple! Posted by Karen at 6:38 AM 1 Click here to leave me a comment.